Actually, they can talk. You just have to listen. This week I got a two poignant refreshers in how important it is to listen to the horse. Even though they can’t speak, horses are pretty good communicators. On Monday, I saddled up my old buddy Frank for a lesson. As usual, before outfitting him in boots, I picked his hooves carefully, checked his shoes, and felt up and down each leg. All looked good. I put the saddle on, and tightened the girth a couple holes, and then led him out into the arena. Frank is good at puffing up his belly when it comes time to tighten the girth, so I take a hole-by-hole, more gradual approach with him, in order to catch him when he exhales. We walked a minute, and I dropped one of the stirrups – and boy, did I get an objection. Frank pinned his ears and swished his tail, and then stood, with a very sour expression on his face. This was not normal for Frank. Christy asked if I had checked his back – and admittedly, I hadn’t – Frank’s back is the one part of him which hasn’t posed a problem in the past. I went back into the aisle, and untacked him. Yep, he was tender along his top line. Christy did some additional checking, and found that his hindquarters were tender, too. We later learned that he had worked pretty hard the day before – and that was the likely culprit. Last night was a variation on a similar theme. We recently discovered that Oliver’s saddle is bridging and causing discomfort. Christy made the discovery after Oliver became very resistant toward the end of a ride. He’s a nice boy and is honest and uncomplicated. Like Frank’s sourness, Oliver’s resistance was unusual. After I untacked, Christy looked at the sweat marks on his back, and noticed that some spots under the saddle were quite a bit warmer than others, indicating that the saddle was putting pressure on a couple points on Oliver’s back, rather than evenly distributing the weight across the surface of the panels. In this case, the first sign that something was amiss came under saddle in the form of unusual resistance. Last night, Oliver was still sore, so I was unable to experiment with a different saddle to see if that gave him relief. I don’t think that horses are brats. Sure, some have behavioral issues and test boundaries, or have training gaps and can be rude on the ground, but I’m not ever willing to say that a horse is exhibiting a behavior simply because it’s ‘bratty.’ There’s always a reason for the behavior, and it’s up to us to be aware of changes, and to look for an underlying cause. 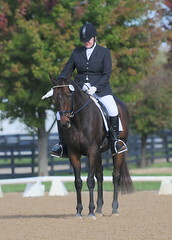 Failure to do so is not only unfair to the horse, but dangerous for the rider. One Response to Actually, they can talk. You just have to listen. They are great communicators if we just listen. I’m glad you ‘heard’ them.